This upcoming month, shopping at the Winter Market will be a whole new culinary experience as Vancouver Farmers Markets hosts its first annual February Food Truck Fest. 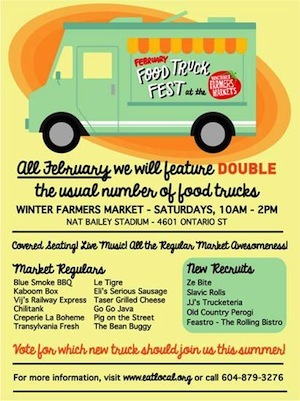 All month long, the Winter Farmers Markets will feature double the usual number of food trucks during the Saturday markets at Nat Bailey Stadium. The Food Truck Fest will be acting as an audition of sorts. Visitors are invited to vote on their favourite food trucks and those will be invited to join the roster as regulars at the busy summer markets. Here’s a list of the vendors who will be there this February. Blue Smoke BBQ: Blue Smoke’s tag line is “Low and Slow on the Go” because their pork is smoked for almost 16 hours. Chilitank: “The best mobile chili tank in town!” Try chili served hot from a ca. 1943 military soup kitchen! Crêperie La Bohème: Sweet and savoury buckwheat crepes served on-site from a charming gypsy caravan. Slavic Rolls: Slavic Rolls offers a great tasting pastry, made fresh in front of customers. Eli’s Serious Sausage: Eli serves up premium sausages handmade with BC pork and all natural ingredients. No filler, no additives, no preservatives. Feastro – The Rolling Bistro: Feastro is the famous purple truck with the fabulous & award winning seafood tacos, fish & chips, salads, chowders and daily specials. Vij’s Railway Express: Celebrity chef Vikram Vij’s latest venture brings his creative Indian cuisine to the streets. JJ’s Trucketeria: The brightest yellow food truck you’ve seen yet, serving seasonal creations made from scratch with a unique cultural mix of flavours. Le Tigre: Chinese street food with a West Coast concept. Old Country Pierogi: Old Country Pierogi brings to market homemade pierogies (regular and gluten-free!) with sweet and savoury fillings. Pig on the Street: Pig On The Street strives to bring taste, sustainability, simplicity & creativity together to the bustling street food scene in Vancouver. Taser Grilled Cheese: Serving gourmet and classic takes on an old favorite. The Kaboom Box: The Kaboom Box is dedicated to promoting and highlighting local and sustainable food. They specialize in salmon and oysters and also make a mean poutine! Transylvania Fresh: Delicious homemade pork-stuffed and vegetarian cabbage rolls made with homemade sour cabbage. Yolks: Specializing in unique breakfasts – try the truffle-lemon hashbrown skewer along with a hollandaise-smothered breakfast sandwich. Ze Bite: Ze bite is Vancouver’s premier French cuisine food truck featuring delicious stews and speciality sandwiches made from scratch with locally sourced ingredients.